Yeah! So, this has become a tradition around here — last year’s were freestanding, but I liked this year’s together as a page. I’ll post each of these separately on my tumblr, too, for conveniently sending to your love interest or nemesis or whatever. Other news: I’m actually getting really close to having everything together to launch my Help Me Print My Book Kickstarter, which is terrifying! I also just ordered STICKER SHEETS, which I could not be more excited about. Love these! Your Valentines are always super adorable. Looking forward to your Kickstarter too! Woo! Yay! Now I’ve just gotta finish up my video and finalize my list of rewards, oh my gosh. I love this comic! It is one of the highlights of my week and I hope it never ends. Oh, yay! Glad you like it. Even though I’m a young transsexual university lecturer with a fetish for sever black outfits, I think I’m more Coco and Nick than Dommi. I forgot Domme was transgendered again… << I love when that happens. I honestly think her friends in-universe probably forget this sometimes too! None of her bandmates met her pre-transition. (ps: there’s also a bonus sequel valentine on my Tumblr. 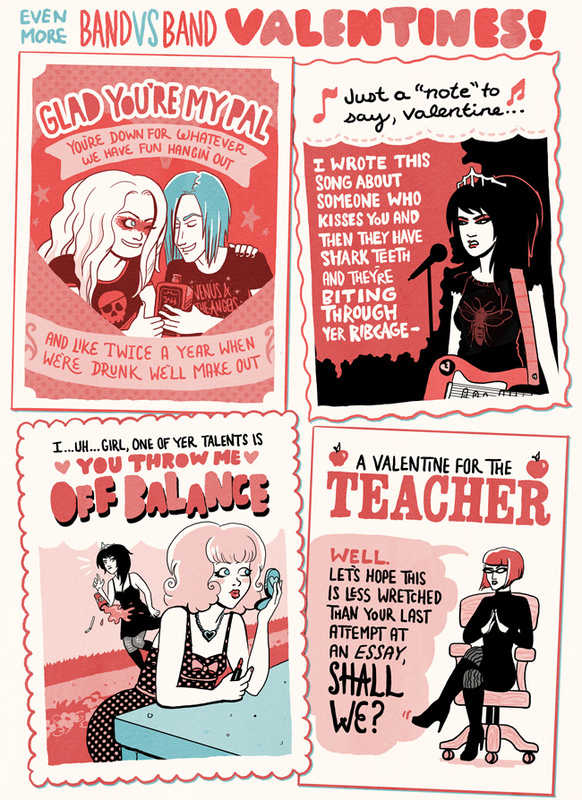 The Turpentine/Honey Hart valentines are the best! Oh, that weirdness was intentional! The BVB style is all about quirky phrasing, and I was also kinda thinking about the Sonic Youth song “Little Trouble Girl”.